Tariff boards are a very popular and up to date way of presenting menus and wine lists as they can be updated easily and quickly by the hotel or restaurant. Tarrif boards can be supplied in a vast range of fabrics, from a cheaper matt laminate fabric or a vision flex PVC to a wood veneer or a faux leather effect. Our tarrif boards are supplied in a full range of sizes, a vast amount of colours and a variety of styles to suit all establishments. Our range of styles of tarrif board include corner mounts, window frame, clip board and magnetic strips, all supplied in a vast range of fabrics and colours. 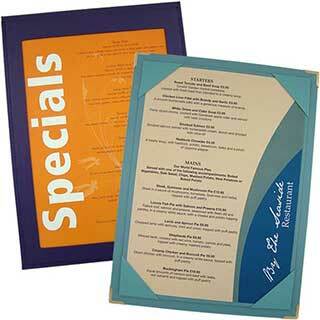 The Matt Laminate tariff hotels menu board features a choice of display methods and sizes. It is made from a wipe clean matt laminated paper and is available in three paper sizes. Wipe clean laminated paper finish. Wide range of colours - Bronze, Burgundy, Dark Blue, Graphite, Light Blue, Pale Green, Purple, Red and Silver. Choice of corner mount or window frame display. Available single or double sided. Available in A3, A4 and A5 sizes. Ash. Our synthetic crocodile skin restaurant tariff board features a range of bright colours in a stylish and textured wipe clean material. It is made from a sybthetic fabric with a crocodile skin feel and a durable finish. Each tariff board is supplied in three sizes with two choices of fixing options, window frame or corner mount. Bright textured cover. Wide range of colours includes: Sand, Red, Plum, Pearl, Orange,Nightshade, Mystic and Blue. Choice of corner mount or window frame display. Available single or double sided. Available in A3, A4 and A5 sizes. The synthetic crocodile skin magnetic tariff board is available in a range of bright colours in a stylish textured wipe clean material. These durable tariff boards come in A4 size with two choices of fixing options. 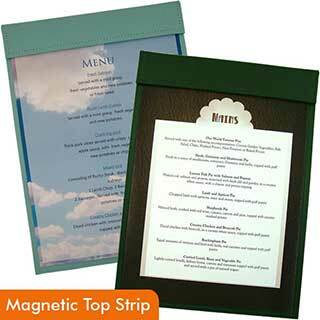 Each style magnet board uses strong magnets hidden within the board to hold your printed menus in place. Bright textured tariff boards. Wide range of colours includes: Sand, Red, Plum, Pearl, Orange,Nightshade, Mystic and Blue. Top strip display. Easy change, strong magnetic board. Ig Magnetic. These excellent tariff boards feature a unique wood effect that is both textured and durable. Available in two styles - window frame and corner mounted. Both styles provide an easy way to keep your menu updated with minimal fuss and are available in two sizes and in single or double sided format. Select from a wide range of vibrant colours in this very popular range. Colours available: Charcoal, Grey, Mushroom, Dk Oak, Mink, Rosewood, Cherry Oak, Orange, Burgundy, Dk Blue, Dk Green, Royal Blue, Lt Blue and Yellow. Textured wood effect tariff board. These excellent tariff boards feature a unique wood effect that is both textured and durable. Available in two styles both with strong magnets making them easy to use and update with your printed menu. Choice of top strip or side strip display. Textured wood style finish. Strong magnet fixings. Top strip display. Easy change, strong magnetic board. Or Magnetic. The faux leather prices board features a range of bright colours in a stylish textured wipe clean material. 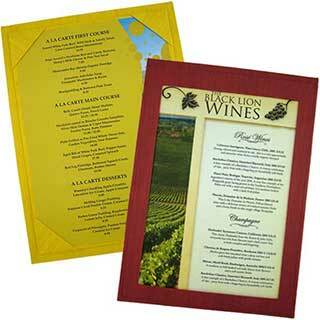 These durable menu displays come in three sizes with two choices of fixing options. 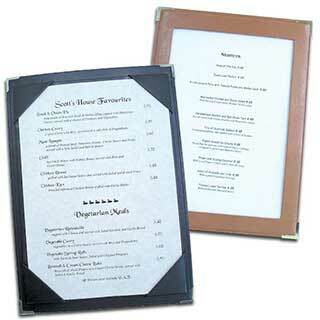 Choice of corner mount or window frame menu displays. Available single or double sided. Available in A3, A4 and A5 sizes. The wooden tariff board combines the solid feeling of wood with leather corner fixings. It is highly durable and comes in three sizes with a choice of wood finishes and corner colours. Choice of Black Ash, Light Ash, Whitewashed, Light Oak, Dark Oak, Maple, Walnut, Mahogany, Cherry and Distressed Oak finishes. Corner mounts. Single or double sided. Available with 21 corner mount colours. Available in A3, A4, and A5 sizes. Our popular range of wood style tariff boards now includes this stylish wooden clip board. Available in a range of beautifully finished wooden colours to complement your printed menu, these tariff boards also feature strong clips in gold or silver. Gold or silver clip fixing. Slim, A4 and A5 sizes available. 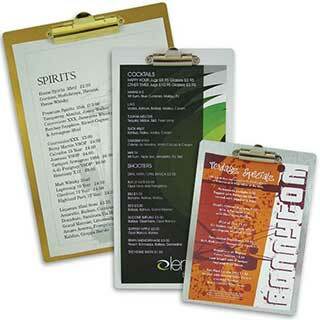 Matching Menu Covers, Key Tags, Room Folders, Bill Presenters, etc. available. Wooden Clip Board. 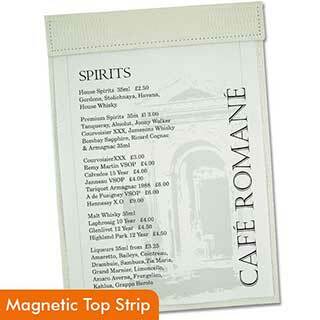 The faux leather magnetic tariff board features a range of bright colours in a wipe clean material. The magnet board is durable and comes in A4 size with a magnetic top strip. Top strip display. Strong magnet fixing. Matching Menu Covers, Key Tags, Room Folders, Bill Presenters, etc. available. Ken Magnetic. The textured faux leather tariff board features a range of brightly textured colours in a stylish wipe clean material. These great new additions to our extensive range of tariff boards provide a beautiful finish unlike any other. Colours available: Black, Green, Red, Sand, Blue, Light Brown, Burgundy and Dark Brown. 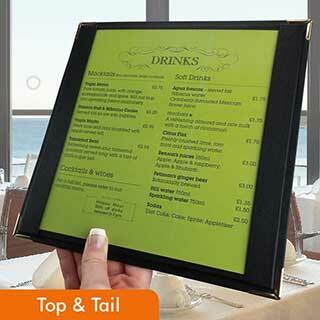 Each of these durable menu displays come in A3, A4 or A5 size with a choice of two fixing options. Matching Menu Covers available. Os. 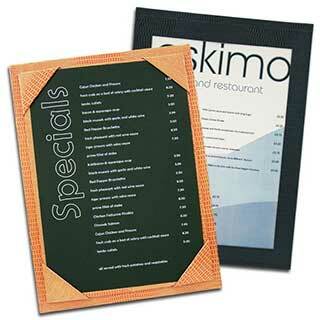 These excellent tariff boards are manufactured from soft textured faux leather. Available in two styles both with strong magnets making them easy to use and update with your printed menu. Choose from many vibrant colours in this very popular range. Colours available: Black, Green, Red, Sand, Blue, Light Brown, Burngundy and Dark Brown. Top strip display. Strong magnet fixing. Matching Menu Covers, Room Folders, Bill Presenters, etc. available. Ken/Os Magnetic. The buckram textured fabric tariff board is supplied in a range of bright colours in a stylish textured wipe clean material. The fabric is very durable and comes in three sizes - A3, A4 and A5 sizes with optional double sided display, also with two choices of fixing options. Wide range of textured colours including Black, Silver, White, Dark Blue, Light Blue, Purple, Dark Brown, Burgundy, Red, Dark Green, Grass, Green and Beige. Textured buckram fabric tariff board. 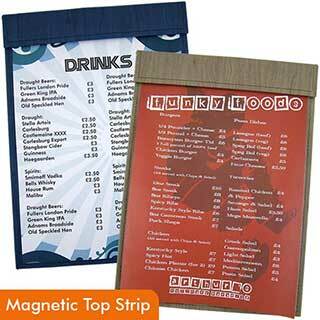 These vibrant tariff boards have strong magnetsin the top strip, making them easy to use and update your printed menu. Textured water resistant material. 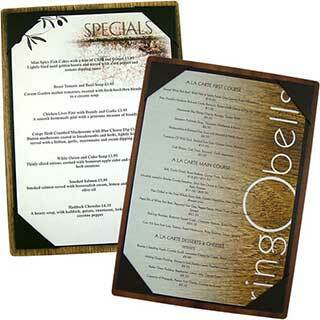 Strong magnets to keep your menus in place making them easy to use and update with your printed menu. Top strip display. Strong magnet fixing. Matching Menu Covers, Room Folders, Bill Presenters, etc. available. Buckram Magnetic. The textured linen fabric tariff board is supplied in a range of colours in a stylish textured wipe clean material. It is durable and comes in three sizes A3, A4 and A5. Optional double sided display, also with two choices of fixing options. Tariff boards with corner mount or window frame display. Available single or double sided. Matching Menu Covers, Room Folders, Bill Presenters, etc. available. Mon. Choice of top strip or side strip display. Strong magnet fixing. 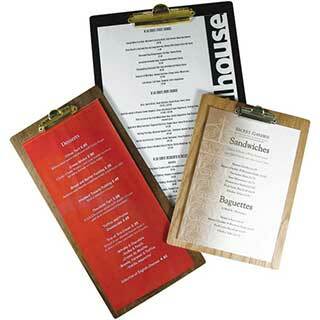 The metal clip board has been designed for use as a tariff board, specials board or daily menu. Where we have tried to improve on previous tariff boards is the sheer ease of use for the client and customer. Strong and robust (although scratching can occur). Full colour personalisation available at extra cost - please contact us for details. Available in 3 sizes - A4, A5 and Slim. Available in Silver, Gold and White. Matching Menu Covers, Room Folders, Bill Presenters, etc. available. Mer Metal. This new and unique tariff board features a central panel in strong, crystal clear PVC which can hold two sides of your printed insert. The metal header and footer can be personalised in any colour or design printed on gold, silver or white metal. This excellent alternative for displaying your printed menus are inexpensive, stylish and modern with a finish that is flexible and durable. Three metal colours - Silver, Gold and White. Five sizes are available - A4, Slim (1/3 A3) , 1/2 A4, A5, 1/3 A4. Metal Header & Footer - Customise in full colour - One off setup cost £20. Per item charge £1.30 - Subject to sight of artwork. Vision Flex. Textured buckram fabric tariff board. 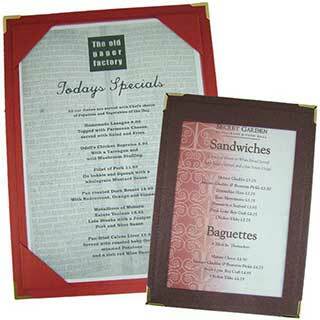 These vibrant tariff boards feature a top and bottom strip making them easy to use and update your printed menu. Textured water resistant material. 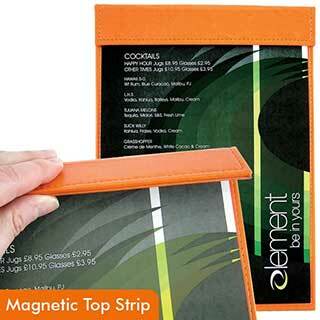 Available in two sizes both with top and bttom strips making them easy to use and update with your printed menu.